Individuals use both passive and active defensive responses to environmental threats. Much is known about the neural circuits of passive defensive responses (e.g., freezing), but less is known about the substrates of active defensive responses (e.g., avoidance). We developed an active avoidance task in which rats learn to avoid a tone-signaled footshock by stepping onto a nearby platform. An advantage of this task is that freezing, which can interfere with avoidance, is reduced, thereby facilitating comparison of the effects of manipulations on avoidance versus freezing. After 10 d of avoidance training, rats were infused with muscimol to pharmacologically inactivate the prelimbic cortex (PL), infralimbic cortex (IL), ventral striatum (VS), or basolateral amygdala (BLA). Inactivating PL, VS, or BLA all impaired avoidance expression, but these areas differed with respect to freezing. Inactivating BLA decreased freezing consistent with loss of the tone–shock association, whereas inactivation of VS increased freezing consistent with loss of avoidance memory. Inactivation of PL had no effect on freezing. Inactivation of IL did not impair avoidance expression but did impair avoidance extinction. Our findings suggest that active avoidance is mediated by prefrontal–striatal circuits, which may be overactive in individuals suffering from trauma-related disorders. To ensure survival, individuals must express both passive and active defensive responses to environmental threats (Darwin, 1872; LeDoux, 2012). Passive responses such as freezing are reflexive (Blanchard and Blanchard, 1969), whereas active responses involve deciding to execute a specific action to avoid a threat (Mowrer and Lamoreaux, 1946). The neural circuits underlying freezing have been studied extensively in rodents using auditory fear conditioning. In this type of conditioning, tone and shock inputs converge and the association is stored in the basolateral nucleus of the amygdala (BLA; Fanselow and LeDoux, 1999; LeDoux, 2000; Blair et al., 2001; Maren and Quirk, 2004; Pelletier et al., 2005). BLA drives conditioned freezing through its projections to the central nucleus of the amygdala (LeDoux et al., 1988; Muller et al., 1997). Expression of amygdala-dependent fear memories is regulated by prelimbic (PL) and infralimbic (IL) prefrontal cortices, which increase and decrease freezing, respectively, through projections to the amygdala (Vidal-Gonzalez et al., 2006; Sotres-Bayon and Quirk, 2010; Amir et al., 2011; Cho et al., 2013). Much less is known about neural circuits mediating active avoidance. As with fear responses, avoidance is excessive in individuals suffering from trauma-related disorders such as post-traumatic stress disorder (PTSD; American Psychiatric Association, 2013), emphasizing the need for understanding the substrates of avoidance. Active avoidance has been most studied using shuttle avoidance tasks, in which rats alternate between adjacent compartments to prevent the occurrence of a tone-signaled shock (Lubar, 1964; Theios and Dunaway, 1964; Wahlsten and Sharp, 1969; Vazdarjanova et al., 2001; Choi et al., 2010; Moscarello and LeDoux, 2013). Because shocks occur in both compartments, there is no “safe” place in the shuttle task: rats must enter a compartment in which they were previously shocked (Lubar, 1964). This positional conflict generates freezing that can oppose shuttling (Theios and Dunaway, 1964; Theios et al., 1966; Savonenko et al., 1999b; Lázaro-Muñoz et al., 2010; Moscarello and LeDoux, 2013). Recent lesion/inactivation studies have implicated the BLA (Choi et al., 2010; Lázaro-Muñoz et al., 2010), striatum (Darvas et al., 2011), and IL in shuttle avoidance (Moscarello and LeDoux, 2013). However, the use of this task makes it difficult to distinguish the effects of lesions on avoidance circuits from effects on freezing circuits. We, therefore, developed an active avoidance task in which rats can avoid a signaled footshock by stepping onto a nearby platform that was never associated with shock, thereby eliminating the positional conflict of shuttle avoidance. Freezing levels are further reduced by bar pressing for sucrose pellets. We pharmacologically inactivated four structures [PL, IL, BLA, or ventral striatum (VS)] and measured tone-induced avoidance as well as tone-induced freezing and suppression of bar pressing. Our goal was to distinguish structures mediating avoidance from those mediating passive fear responses by comparing the effects of inactivation across behaviors. A total of 156 male Sprague Dawley rats (Harlan Laboratories) weighing 300–360 g were housed and handled as described previously (Quirk et al., 2000). Rats were restricted to 18 g/d standard laboratory rat biscuits, followed by 7 d of training to press a bar for sucrose pellets on a variable interval schedule of reinforcement averaging 30 s (VI–30 s). Rats were trained until they reached a criterion of 10 presses per minute. All procedures were approved by the Institutional Animal Care and Use Committee of the University of Puerto Rico School of Medicine, in compliance with the National Institutes of Health Guide for the Care and Use of Laboratory Animals (eighth edition). After bar-press training, rats were anesthetized with isofluorane inhalant gas (5%) in an induction chamber and positioned in a stereotaxic frame. Isofluorane (2–3%) was delivered through a face mask for anesthesia maintenance. Rats were implanted bilaterally with 26 gauge guide cannulas (Plastics One) targeting PL (AP, +3.0 mm; ML, ±0.60 mm; DV, −2.5 mm), IL (AP, 2.8 mm; ML, ±0.60 mm; DV, −4.2 mm), BLA (AP, −2.8 mm; ML, ±5.0 mm; DV, −7.6 mm), or VS (AP, +2.0 mm; ML, ±2.0 mm; DV, −6.4 mm; Paxinos and Watson 1998). For IL, an angled placement (30°) was used to avoid backflow into PL (Sierra-Mercado et al., 2011). Cannulas were fixed to the skull with dental cement and three stainless steel screws. After surgery, a triple antibiotic (Neosporin) was applied around the wound margin, and an NSAID analgesic (Ketofen; 2 mg/kg) was injected intramuscularly. Stainless steel obturators (33 gauge) were inserted into the guide cannulas to prevent cannula blockage until infusions were made. After surgery, animals were allowed to recover for 7 d before the experiments. Rats were infused as described previously (Sierra-Mercado et al., 2011). The day before infusions, injectors were briefly inserted into the cannulas without infusing, and rats were acclimated for infusion handling. Injector tips extended 1.0 mm beyond the guide cannula. Muscimol (MUS; Sigma-Aldrich) was used to enhance GABAA receptor activity, thereby inactivating target structures, and was infused 45 min before behavioral testing. MUS or saline vehicle (SAL) was infused at a rate of 0.2 μl/min for PL or IL (0.11 nmol/0.2 μl per side) and 0.25 μl/min for BLA (0.11 nmol/0.5 μl per side) and VS (0.11 nmol/0.3 μl per side). Dosages of MUS were selected to match our previous study of PL, IL, and BLA in fear conditioning (Sierra-Mercado et al., 2011), in which these dosages did not affect locomotion. After infusion, injectors were left in place for 1 min to allow the drug to diffuse. Rats were conditioned and tested in standard operant chambers (26.7 cm long, 27.9 cm wide, 27.9 cm tall; Coulbourn Instruments) located in sound-attenuating cubicles (MED Associates). The floor of the chambers consisted of stainless steel bars delivering a scrambled electric footshock. Between experiments, shock grids and floor trays were cleaned with soap and water, and chamber walls were cleaned with wet paper towels. Sucrose pellets were available on a VI–30 s schedule throughout all phases of training, testing, and extinction. Availability of reward motivated rats to leave the platform during the intertrial interval, enabling trial-by-trial assessment of avoidance. Rats were conditioned with a pure tone (30 s, 4 kHz, 75 dB) coterminating with a shock delivered through the floor grids (2 s, 0.4 mA). The intertrial interval was variable, averaging 3 min. Compared with our fear conditioning task, we used a longer shock duration (2 s vs 0.5 s) to mobilize rats onto the platform and a slightly lower shock intensity (0.4 mA vs 0.5 mA) to prevent overconditioning. An acrylic square platform (14.0 cm each side, 0.33 cm tall) located in the opposite corner of the sucrose-delivering bar protected rats from the shock. The platform was fixed to the floor and was present in all stages of training (including bar-press training) to reduce novelty. Rats were conditioned for 10 d to reduce tone-induced freezing and allow spontaneous press rates to return to preconditioning levels. Each day, rats received three sessions consisting of three tone–shock trials each (nine tone–shock pairings per day). Rats were left in the training chamber between sessions for 5 min to reinforce bar-press training and to reduce contextual fear. Rats failing to avoid during the first two trials of day 10 of conditioning were excluded from the experiment (5 of 156 rats). On day 11, rats were infused with either muscimol or saline and presented with a two-tone test with the shocker off. For the avoidance extinction experiment, rats were presented daily with 15 tones without shocks in the same conditioning chamber with the platform present. After two extinction training days, rats were presented with an extinction test (two tones) the following day. After completion of experiments, rats were transcardially perfused with 0.9% saline followed by 10% buffered formalin. Brains were extracted and stored in a 30% sucrose/10% formalin solution for 3 d. Coronal sections were cut (40 μm thick) on a cryostat, mounted on slides, and stained for Nissl bodies for cannula placement histology. Because of misplacement of cannulas on one or both sides of the brain, 20 of 151 rats were excluded from this study, leaving a total of 131 rats. Behavior was recorded with digital video cameras (Micro Video Products), and freezing was detected using software (Freezescan; Clever Systems). Trials of experimental groups (SAL and MUS) were compared with unpaired Student's two-tailed t tests for avoidance expression experiments or repeated-measures ANOVA, followed by Tukey's post hoc comparisons (STATISTICA; StatSoft) for the avoidance extinction experiment. The amount of time freezing to the tone was expressed as a percentage of the tone duration. We also measured time spent freezing 1 min before tone onset (pretone freezing). Successful avoidance was defined as the rat having at least two paws on the platform between seconds 28 and 30 of the tone (shock period). Avoidance was scored from video recordings of the sessions by a trained observer. We also measured time spent on the platform 1 min before tone onset (pretone avoidance) as well as during the tone. We measured percent suppression of bar pressing to the tone (Quirk et al., 2000), calculated as follows: (pretone rate − tone rate)/(pretone rate + tone rate) × (100). A value of 0 indicates no suppression, whereas a value of 100 indicates complete suppression. 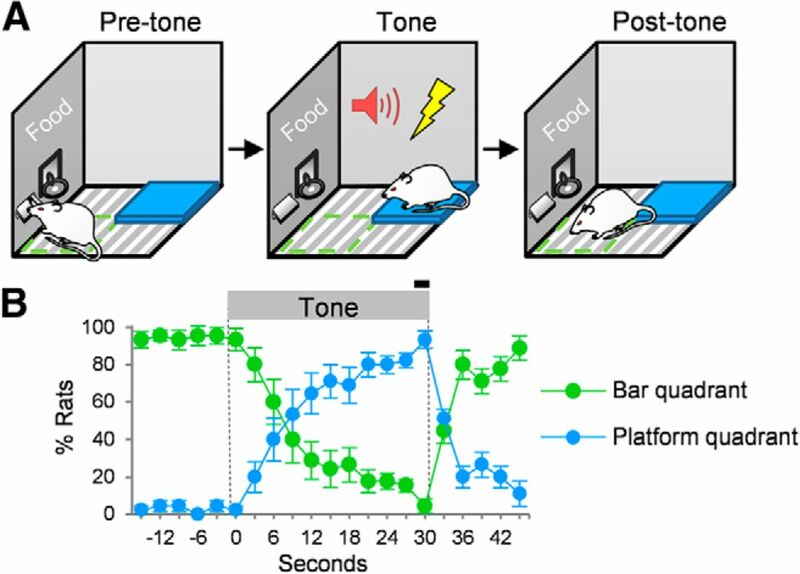 For conditioning of platform-mediated avoidance, rats were presented with nine tone–shock trials per day. Because the platform was located far from the sucrose-delivering bar, mounting prevented rats from bar pressing, thereby constituting a “cost” of avoidance. We used a cohort of unimplanted rats to characterize several behaviors across acquisition of avoidance training. After 10 d of conditioning, rats learned to step onto the platform at the start of the tone, returning to the bar at the end of the tone (30 s; Fig. 1). After the first day of conditioning, freezing and suppression increased, intertrial interval pressing decreased, but avoidance was still minimal. With additional days of training, avoidance increased, freezing decreased, and ITI pressing returned to preconditioning levels (Fig. 2). This is consistent with earlier (Mowrer and Lamoreaux, 1946; Miller, 1948; Mowrer, 1960) as well as more recent (Choi et al., 2010; Lázaro-Muñoz et al., 2010; Martinez et al., 2013; Moscarello and LeDoux, 2013) studies showing that acquisition of avoidance reduces freezing, reflecting the adaptive nature of avoidance. We next used pharmacological inactivation to determine the structures mediating expression of platform-mediated avoidance. Expression of platform-mediated avoidance. A, Rats press a bar for sucrose pellets (green quadrant). At tone onset, they gradually step onto the platform to avoid shock (blue quadrant). At tone offset, they gradually return to the bar. B, The position of the rat was defined as the quadrant in which both front paws were located and was scored every 3 s from videos by a trained observer. Position data were scored for days 9 and 10 of conditioning (Trials 1–3, n = 12 rats). The black bar indicates shock. In this and subsequent figures, error bars depict SEM. Acquisition of platform-mediated avoidance. A, Rats were trained for 10 d, receiving nine avoidance trials per day. As rats learn to avoid, freezing to the tone gradually decreases, and bar pressing during the intertrial interval (ITI) returns to preconditioning levels. Data shown are from unimplanted rats (n = 31). % Avoidance refers to the percentage of rats that successfully avoided in a given trial. % Freezing refers to the percentage of 30 s tone spent freezing in each trial. B, Behavioral data are shown for the first trial of day 1 (D1), day 2 (D2), and day 10 (D10). On day 2, rats showed little avoidance, but high levels of freezing and suppression of bar pressing. By day 10, rats showed high avoidance, low freezing, and high suppression. In our auditory fear-conditioning task, in which rats also bar press for sucrose, inactivation of PL impairs both conditioned freezing and tone-induced suppression of bar pressing (Corcoran and Quirk, 2007; Sierra-Mercado et al., 2011). Moreover, PL neurons exhibit sustained tone responses correlating with freezing across the 30 s tone (Burgos-Robles et al., 2009; Sotres-Bayon et al., 2012). Inactivation of IL in fear conditioning does not block expression of conditioned freezing but impairs its extinction (Laurent and Westbrook, 2009b; Sierra-Mercado et al., 2011). Given that PL and IL are capable of modulating tone-triggered freezing (Sotres-Bayon and Quirk, 2010), we reasoned that these structures might also modulate tone-triggered avoidance. We, therefore, inactivated either PL or IL after 10 d of conditioning (on day 11), using the same dose of muscimol that we used previously (Sierra-Mercado et al., 2011). There was little contextual fear across all experiments (SAL and MUS groups), as evidenced by low levels of pretone freezing (all group averages <13.4%) and low levels of pretone time on platform (all group averages <13.9%). As shown in Figure 3A, inactivation of PL reduced avoidance (SAL, 85.7%; MUS, 26.7%; t(34) = 3.73; p < 0.001) but did not reduce freezing (SAL, 60.0%; MUS, 68.4%; t(34) = 0.69; p = 0.49), spontaneous bar pressing (SAL, 17.8 presses/min; MUS, 18.6 presses/min; t(34) = 0.25; p = 0.80), or suppression of bar pressing (SAL, 83.9%; MUS, 90.0%; t(34) = 0.62; p = 0.54). PL inactivation also reduced time on platform during the tone (SAL, 65.7%; MUS, 29.6%; t(34) = 2.54; p = 0.016). This contrasts with auditory fear conditioning, in which PL inactivation reduced both freezing and suppression of bar pressing (Sierra-Mercado et al., 2011). In contrast to PL, as shown in Figure 3B, inactivation of IL had no effect on avoidance (SAL, 81.3%; MUS, 80.0%; t(26) = 0.08; p = 0.94) or time on platform during tone (SAL, 96.7%; MUS, 61.0%; t(26) = 0.70; p = 0.49). Furthermore, passive fear was increased, as indicated by freezing (SAL, 27.3%; MUS, 49.5%; t(26) = 2.30; p = 0.030), suppression of bar pressing (SAL, 88.0%; MUS, 99.1%; t(26) = 2.15; p = 0.048), and spontaneous press rates (SAL, 22.7 presses/min; MUS, 13.1 presses/min; t(26) = 2.68; p = 0.017). This increase in passive fear suggests that IL reduces freezing during avoidance as previously shown (Moscarello and LeDoux, 2013), but is not necessary for expression of platform-mediated avoidance. Effects of inactivation of PL, IL, VS, or BLA on avoidance and passive fear responses. A, Inactivation of PL with muscimol impaired avoidance but did not alter freezing or suppression (MUS, n = 17; SAL, n = 18). B, Inactivation of IL did not impair avoidance but increased freezing and suppression (MUS, n = 13; SAL, n = 16). C, Inactivation of VS impaired avoidance and increased freezing (MUS, n = 8; SAL, n = 12). 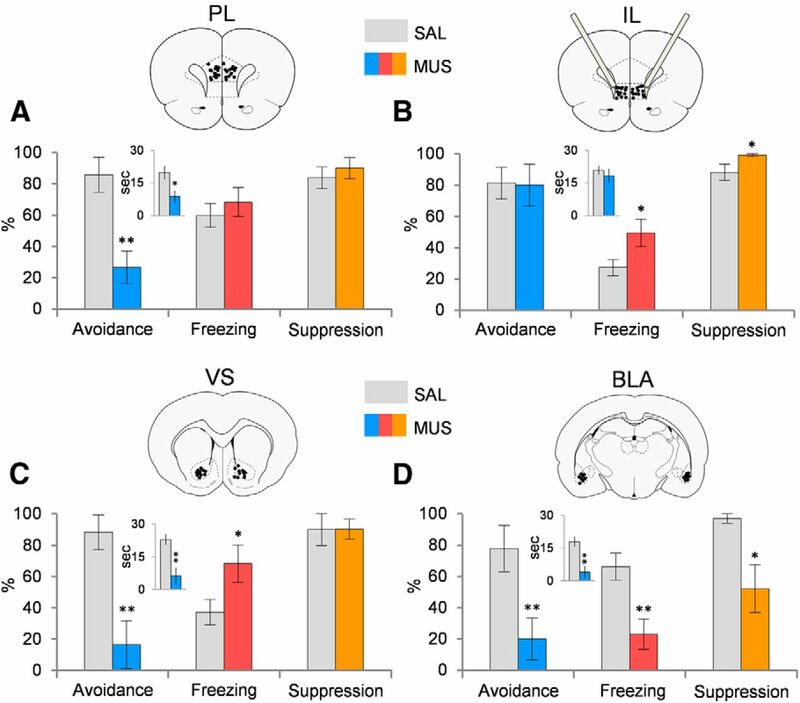 D, Inactivation of BLA impaired avoidance and decreased both freezing and suppression, consistent with loss of the tone–shock association (MUS, n = 8; SAL, n = 10). Data are presented for the first trial of Day 11. *p < 0.05; **p < 0.01, Student's t test (unpaired, two-tailed). The inset graphs indicate the time (in seconds) spent on the platform during the tone. Atlas figures indicate placements of injector tips. PL projects robustly to VS (Sesack et al., 1989; Gabbott et al., 2005), an area implicated in locomotor control (Kelly and Moore, 1976) and shuttle avoidance (Darvas et al., 2011). A recent study reported delayed acquisition of avoidance after pretraining VS lesions (Wendler et al., 2014), but no prior study examined the role of VS in the expression of previously acquired avoidance. We, therefore, tested whether VS was critical for platform-mediated avoidance by inactivating the VS region receiving the most input from PL (covering both the core and shell of accumbens; Sesack et al., 1989). Similar to PL, inactivation of VS impaired avoidance (SAL, 88.9%; MUS, 16.4%; t(19) = 3.18; p = 0.005), as shown in Figure 3C. Additionally, VS inactivation also decreased time on platform during tone (SAL, 76.3%; MUS, 4.2%; t(19) = 8.10; p < 0.001). Inactivation of VS also increased freezing (SAL, 37.0%; MUS, 68.3%; t(19) = 2.16; p = 0.043) but had no effect on suppression of bar pressing (SAL, 89.9%; MUS, 90.1%; t(19) = 1.07; p = 0.30) or on spontaneous pressing (SAL, 12.6 presses/min; MUS, 10.3 presses/min; t(19) = 0.72; p = 0.48). Thus, both VS and PL are necessary for avoidance. To address possible effects on locomotion, we performed an open field test. We corroborated that inactivation of VS does not alter locomotion (t(12) = 0.97; p = 0.35) similar to a previous study (Atallah et al., 2007). Additionally, to test for a possible interaction between freezing and avoidance, we performed a regression analysis comparing freezing with time on platform across all four experiments (n = 97) and found no significant correlation (r = 0.12; F(1,96) = 1.51; p = 0.22), suggesting that freezing does not compete with avoidance in this task. Another PL target is the BLA (Chiba et al., 2001; Vertes, 2004; Gabbott et al., 2005), which is necessary for acquisition, expression, and extinction of conditioned fear (LeDoux, 2000; Anglada-Figueroa and Quirk, 2005; Blair et al., 2005; Davis, 2006; Ponnusamy et al., 2007; Laurent and Westbrook, 2009a; Sotres-Bayon et al., 2012). Lesions or inactivation of BLA impair expression of shuttle avoidance (Choi et al., 2010) as well as “escape from fear” (Amorapanth et al., 2000). In agreement with these findings, we found that inactivation of BLA virtually eliminated expression of platform-mediated avoidance (SAL, 80.0; MUS, 18.8%; t(17) = 3.29; p = 0.0045; Fig. 3D) and reduced time on platform during the tone (SAL, 76.3; MUS, 20.7%; t(17) = 3.58; p = 0.002). However, in contrast to PL, IL, and VS, inactivation of BLA significantly reduced both freezing (SAL, 66.3%; MUS, 23.0%; t(17) = 3.30; p = 0.004) and bar-press suppression (SAL, 96.9%; MUS, 52.2%; t(17) = 2.19; p = 0.043; Fig. 3D) but had no effect on spontaneous pressing (SAL, 16.3 presses/min; MUS, 20.0 presses/min; t(17) = 0.66; p = 0.51). The reduction in passive fear to the tone (freezing and suppression) is consistent with the role of BLA in storage of the tone–shock association (Quirk et al., 1995; LeDoux, 2000; Blair et al., 2001). Previous studies have linked IL to fear extinction (Mueller et al., 2010; Peters et al., 2010; Santini and Porter, 2010; Thompson et al., 2010; Fontanez-Nuin et al., 2011; Holmes et al., 2012), proposing that IL inhibits freezing via feed-forward inhibition of the amygdala (Quirk et al., 2003; Amano et al., 2010; Amir et al., 2011). In particular, inactivating IL immediately before fear extinction training leaves extinction intact but impairs retrieval of extinction the next day (Laurent and Westbrook, 2009b; Sierra-Mercado et al., 2011; Holmes et al., 2012). We, therefore, hypothesized that IL may also be important for extinction of avoidance. 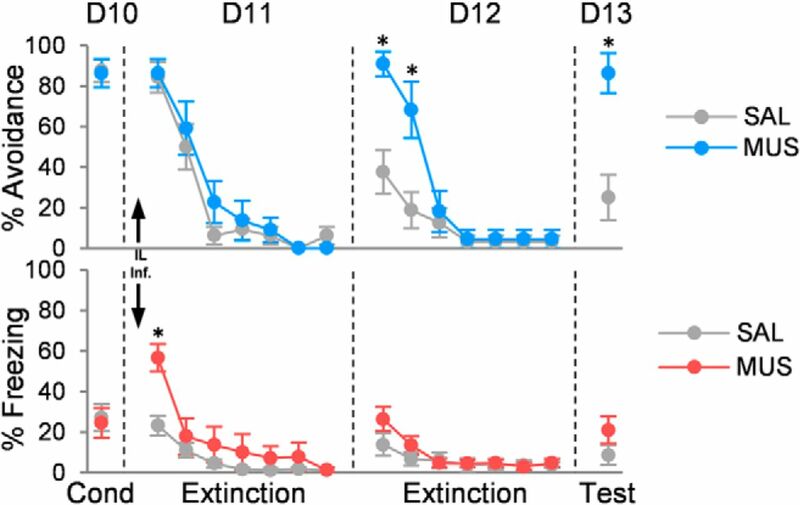 Inactivation of IL had no effect on within-session extinction of avoidance on day 11 (Fig. 4). ANOVA on this day revealed no effect of group (F(1,28) = 0.84; p = 0.37) or interaction of group with trial block (F(6,150) = 0.85; p = 0.53). The following day (day 12), retrieval of avoidance extinction was impaired (group: F(1,28) = 7.97, p = 0.009; trial block: F(6,150) = 30.40, p < 0.001; interaction: F(6,150) = 7.39, p < 0.001). Post hoc comparisons confirmed that MUS-infused rats avoided more than controls in trial blocks 1 and 2 (p < 0.05), and showed elevated suppression in block 1 (p = 0.030). Surprisingly, MUS-infused rats continued to show impaired retrieval of avoidance extinction 1 d later (day 13; SAL, 25.0%; MUS, 86.4%; t(28) = 3.90; p < 0.001) despite receiving extinction drug free the previous day. Inactivation of IL also reduced spontaneous bar pressing on day 11 (SAL, 22.7 presses/min; MUS, 13.1 presses/min; t(28) = 2.68; p = 0.017) and increased tone-induced suppression on day 12 (SAL, 29.4%; MUS, 74.9%; t(28) = 4.22; p < 0.001). Freezing was elevated only during the first block of extinction on day 11 (SAL, 23.2%; MUS, 56.7%; t(28) = 4.07; p < 0.001), but not during subsequent drug-free days. Thus, inactivating IL during the first day of extinction prevented rats from subsequently learning extinction. Inactivation of infralimbic cortex impairs extinction of platform-mediated avoidance. Inactivating IL with muscimol had no effect on within-session extinction of avoidance (D11), but impaired retrieval of extinction on day 12 (D12) and day 13 (D13; both drug free). Increased avoidance on these days was not accompanied by an increase in freezing. Data are shown in blocks of two trials (MUS, n = 11; SAL, n = 16). Arrows indicates infusion. *p < 0.05, Tukey's post hoc test. We developed a signaled active avoidance task that facilitates comparison of passive fear responses (freezing and suppression) with avoidance responses. Pharmacological inactivation of PL, VS, or BLA all blocked avoidance. Unlike inactivation of PL and VS, inactivation of BLA decreased passive fear responses. Inactivation of IL left avoidance intact but impaired subsequent extinction of avoidance. VS represents a limbic–motor interface (Mogenson et al., 1980) and is critical for instrumental conditioning (Cardinal et al., 2002); however, there are few studies directly assessing its role in active avoidance. Acquisition of shuttle avoidance was impaired by pretraining lesions of the VS (Wendler et al., 2014). Additionally, restoring dopamine in the striatum of dopamine-depleted mice rescued shuttle avoidance learning (Darvas et al., 2011). Rather than acquisition of avoidance, we focused on expression of previously learned avoidance. Inactivation of VS blocked the expression of platform-mediated avoidance but also increased passive fear to the tone, indicating that rats maintained the tone–shock association in the absence of avoidance memory. In auditory fear conditioning, there is extensive evidence that the BLA stores the tone–shock association (Fanselow and LeDoux, 1999; LeDoux, 2000; Blair et al., 2001; Maren and Quirk, 2004; Pelletier et al., 2005; Davis, 2006). This is consistent with our observation that both avoidance and fear responses to the tone were lost after BLA inactivation. Thus, rats would not be expected to express either passive fear or avoidance to tones no longer associated with shocks. This is consistent with reduced expression of tone-signaled shuttle avoidance after lesions of the basal or lateral nuclei of the amygdala (Choi et al., 2010), as well as the lack of effect of amygdala lesions on expression of Sidman shuttle avoidance, in which there is no tone (Lázaro-Muñoz et al., 2010). We found that inactivation of PL impaired avoidance expression but had no effect on freezing or suppression. Previous studies have not examined the effect of post-training lesions or inactivation of PL on the expression of active avoidance. Pretraining lesions of PL were shown to have no effect on shuttle avoidance (Moscarello and LeDoux, 2013), suggesting the possibility of post-lesion recovery of function. The lack of effect on freezing contrasts with our previous fear-conditioning studies, in which PL inactivation reduced both freezing and suppression of bar pressing to a conditioned tone (Sierra-Mercado et al., 2011). Platform-mediated avoidance requires many more days of training than fear conditioning (10 d vs 1 d), which may recruit additional regions into the freezing circuit (Poulos et al., 2010; Zelikowsky et al., 2013). Unit recording data will be needed to further understand the role of PL in avoidance. PL projects densely to the VS (Sesack et al., 1989; Vertes, 2004) and could drive avoidance through these projections (Fig. 5). Alternatively, PL could modulate VS indirectly through BLA (Sesack et al., 1989; Vertes, 2004), which then projects to the VS (Kita and Kitai, 1990; Stuber et al., 2011), or through other structures. Projections from BLA to VS have been previously proposed for active avoidance (Killcross et al., 1997; LeDoux and Gorman, 2001), but additional techniques (e.g., optogenetics) are needed to identify the specific circuits of active avoidance. Possible circuits of platform-mediated avoidance. Left, Table summarizing inactivation data. Right, Circuit that could mediate avoidance and freezing to a conditioned tone. PL receives conditioned tone response from the BLA and could drive avoidance through direct or indirect projections to VS. In contrast to PL, inactivation of IL did not impair platform-mediated avoidance, even though it increased freezing and suppression. The increase in passive fear replicates a recent finding from a shuttle avoidance task, in which IL inactivation increased freezing; however, the expression of avoidance was also impaired in that study (Moscarello and LeDoux, 2013). Because freezing more readily competes with avoidance in the shuttle task (Savonenko et al., 1999a; Choi et al., 2010; Martinez et al., 2013), IL may mediate inhibition of freezing but may not mediate expression of avoidance. In platform-mediated avoidance, freezing is somewhat reduced because of a lower level of shock (0.4 vs 0.7 mA) as well as the motivation to press for sucrose. Under these conditions, IL is not necessary for avoidance even though it inhibits freezing. Importantly, we found that IL is necessary for forming a memory of extinction of avoidance, consistent with its role in extinction of fear conditioning (Burgos-Robles et al., 2007; Laurent and Westbrook, 2009b; Amir et al., 2011; Fontanez-Nuin et al., 2011; Sierra-Mercado et al., 2011). Previous studies have linked extinction of active avoidance with the amygdala (Jiao et al., 2011), medial septum (Pang et al., 2011), and anterior thalamus (Gabriel et al., 1983), but not to IL. This adds to a growing number of tasks for which IL is essential for extinction, including appetitive conditioning (Rhodes and Killcross, 2004; Rhodes and Killcross, 2007; Peters and De Vries, 2013), conditioned taste aversion (Mickley et al., 2005), and cocaine seeking (Peters et al., 2008). IL could mediate extinction of avoidance via projections to VS and/or to the amygdala. Interestingly, inactivation of IL impeded subsequent extinction learning, even under drug-free conditions. A similar finding has been reported for extinction of step-down inhibitory avoidance (Cammarota et al., 2005), suggesting the existence of a critical time window for the learning of avoidance extinction. Excessive avoidance is now a required symptom for the diagnosis of PTSD (American Psychiatric Association, 2013). Emerging findings from human functional imaging studies implicate the PL–VS circuit in avoidance: (1) the dorsal anterior cingulate cortex (dACC), which is a functional homolog of PL (Milad et al., 2007), has been linked to avoidance of snakes (Nili et al., 2010) and shocks (Straube et al., 2009); and (2) VS has also been linked to avoidance of shocks (Delgado et al., 2009). PTSD patients show excessive activity in dACC as well as decreased activity in the ventromedial prefrontal cortex (vmPFC; a functional homolog of IL; Milad et al., 2009; Linnman et al., 2012). Excessive avoidance in PTSD, therefore, may reflect excessive activity in cingulate–striatal circuits mediating avoidance expression and/or deficient activity in vmPFC circuits mediating avoidance extinction. Supplemental material for this article is available at http://media.md.rcm.upr.edu/Mediasite/Play/07ed951d40254bc5889a25ac71e945761d. It is a video example of platform-mediated avoidance. This material has not been peer reviewed. This work was supported by an American Psychology Association Diversity Program in Neuroscience fellowship and Grant MH102968 to C.B.-R., by Grants MH058883 and MH086400 to G.J.Q., and by the University of Puerto Rico President's Office. We thank E. Martinez-Maria, H. D. Bravo-Rivera, and M. Montesinos-Cartagena for surgical and experimental assistance. We also thank J. M. Moscarello and J.E. LeDoux for helpful comments on this manuscript. (2010) Synaptic correlates of fear extinction in the amygdala. Nat Neurosci 13:489–494, doi:10.1038/nn.2499, pmid:20208529. (2013) Diagnostic and statistical manual of mental disorders (American Psychiatric Publishing, Arlington, VA), Ed 5. (2011) Physiological identification and infralimbic responsiveness of rat intercalated amygdala neurons. J Neurophysiol 105:3054–3066, doi:10.1152/jn.00136.2011, pmid:21471396. (2000) Different lateral amygdala outputs mediate reactions and actions elicited by a fear-arousing stimulus. Nat Neurosci 3:74–79, doi:10.1038/71145, pmid:10607398. (2005) Lesions of the basal amygdala block expression of conditioned fear but not extinction. J Neurosci 25:9680–9685, doi:10.1523/JNEUROSCI.2600-05.2005, pmid:16237172. (2007) Separate neural substrates for skill learning and performance in the ventral and dorsal striatum. Nat Neurosci 10:126–131, doi:10.1038/nn1817, pmid:17187065. (2001) Synaptic plasticity in the lateral amygdala: a cellular hypothesis of fear conditioning. Learn Mem 8:229–242, doi:10.1101/lm.30901, pmid:11584069. (2005) The lateral amygdala processes the value of conditioned and unconditioned aversive stimuli. Neuroscience 133:561–569, doi:10.1016/j.neuroscience.2005.02.043, pmid:15878802. (1969) Crouching as an index of fear. J Comp Physiol Psychol 67:370–375, doi:10.1037/h0026779, pmid:5787388. (2007) Consolidation of fear extinction requires NMDA receptor-dependent bursting in the ventromedial prefrontal cortex. Neuron 53:871–880, doi:10.1016/j.neuron.2007.02.021, pmid:17359921. (2009) Sustained conditioned responses in prelimbic prefrontal neurons are correlated with fear expression and extinction failure. J Neurosci 29:8474–8482, doi:10.1523/JNEUROSCI.0378-09.2009, pmid:19571138. (2005) Relationship between short- and long-term memory and short- and long-term extinction. Neurobiol Learn Mem 84:25–32, doi:10.1016/j.nlm.2005.03.002, pmid:15936680. (2002) Emotion and motivation: the role of the amygdala, ventral striatum, and prefrontal cortex. Neurosci Biobehav Rev 26:321–352, doi:10.1016/S0149-7634(02)00007-6, pmid:12034134. (2001) Efferent projections of infralimbic and prelimbic areas of the medial prefrontal cortex in the Japanese monkey, Macaca fuscata. Brain Res 888:83–101, doi:10.1016/S0006-8993(00)03013-4, pmid:11146055. (2013) Synaptic encoding of fear extinction in mPFC-amygdala circuits. Neuron 80:1491–1507, doi:10.1016/j.neuron.2013.09.025, pmid:24290204. (2010) The role of amygdala nuclei in the expression of auditory signaled two-way active avoidance in rats. Learn Mem 17:139–147, doi:10.1101/lm.1676610, pmid:20189958. (2007) Activity in prelimbic cortex is necessary for the expression of learned, but not innate, fears. J Neurosci 27:840–844, doi:10.1523/JNEUROSCI.5327-06.2007, pmid:17251424. (2011) Requirement of dopamine signaling in the amygdala and striatum for learning and maintenance of a conditioned avoidance response. Learn Mem 18:136–143, doi:10.1101/lm.2041211, pmid:21325435. (1872) The expression of the emotions in man and animals (Fontana, London). (2006) Neural systems involved in fear and anxiety measured with fear-potentiated startle. Am Psychol 61:741–756, doi:10.1037/0003-066X.61.8.741, pmid:17115806. (2009) Avoiding negative outcomes: tracking the mechanisms of avoidance learning in humans during fear conditioning. Front Behav Neurosci 3:33, doi:10.3389/neuro.08.033.2009, pmid:19847311. (1999) Why we think plasticity underlying Pavlovian fear conditioning occurs in the basolateral amygdala. Neuron 23:229–232, doi:10.1016/S0896-6273(00)80775-8, pmid:10399930. (2011) Memory for fear extinction requires mGluR5-mediated activation of infralimbic neurons. Cereb Cortex 21:727–735, doi:10.1093/cercor/bhq147, pmid:20705895. (1983) Anterior thalamic lesions and neuronal activity in the cingulate and retrosplenial cortices during discriminative avoidance behavior in rabbits. Behav Neurosci 97:675–696, doi:10.1037/0735-7044.97.5.675, pmid:6639743. (2012) Chronic alcohol remodels prefrontal neurons and disrupts NMDAR-mediated fear extinction encoding. Nat Neurosci 15:1359–1361, doi:10.1038/nn.3204, pmid:22941108. (2011) Avoidance perseveration during extinction training in Wistar-Kyoto rats: an interaction of innate vulnerability and stressor intensity. Behav Brain Res 221:98–107, doi:10.1016/j.bbr.2011.02.029, pmid:21376086. (1976) Mesolimbic dopaminergic neurones in the rotational model of nigrostriatal function. Nature 263:695–696, doi:10.1038/263695a0, pmid:980114. (1997) Different types of fear-conditioned behaviour mediated by separate nuclei within amygdala. Nature 388:377–380, doi:10.1038/41097, pmid:9237754. (1990) Amygdaloid projections to the frontal cortex and the striatum in the rat. J Comp Neurol 298:40–49, doi:10.1002/cne.902980104, pmid:1698828. (2009a) Infusion of the NMDA receptor antagonist, DL-APV, into the basolateral amygdala disrupts learning to fear a novel and a familiar context as well as relearning to fear an extinguished context. Learn Mem 16:96–105, doi:10.1101/lm.1218709, pmid:19141468. (2009b) Inactivation of the infralimbic but not the prelimbic cortex impairs consolidation and retrieval of fear extinction. Learn Mem 16:520–529, doi:10.1101/lm.1474609, pmid:19706835. (2010) Sidman instrumental avoidance initially depends on lateral and basal amygdala and is constrained by central amygdala-mediated Pavlovian processes. Biol Psychiatry 67:1120–1127, doi:10.1016/j.biopsych.2009.12.002, pmid:20110085. (2000) Emotion circuits in the brain. Annu Rev Neurosci 23:155–184, doi:10.1146/annurev.neuro.23.1.155, pmid:10845062. (2012) Evolution of human emotion: a view through fear. Prog Brain Res 195:431–442, doi:10.1016/B978-0-444-53860-4.00021-0, pmid:22230640. (2001) A call to action: overcoming anxiety through active coping. Am J Psychiatry 158:1953–1955, doi:10.1176/appi.ajp.158.12.1953, pmid:11729007. (1988) Different projections of the central amygdaloid nucleus mediate autonomic and behavioral correlates of conditioned fear. J Neurosci 8:2517–2529, pmid:2854842. (2012) Resting cerebral metabolism correlates with skin conductance and functional brain activation during fear conditioning. Biol Psychol 89:450–459, doi:10.1016/j.biopsycho.2011.12.012, pmid:22207247. (1964) Effect of medial cortical lesions on the avoidance behavior of the cat. J Comp Physiol Psychol 58:38–46, doi:10.1037/h0041014, pmid:14197039. (2004) Neuronal signalling of fear memory. Nat Rev Neurosci 5:844–852, doi:10.1038/nrn1535, pmid:15496862. (2013) Active vs. reactive threat responding is associated with differential c-Fos expression in specific regions of amygdala and prefrontal cortex. Learn Mem 20:446–452, doi:10.1101/lm.031047.113, pmid:23869027. (2005) A role for prefrontal cortex in the extinction of a conditioned taste aversion. Brain Res 1051:176–182, doi:10.1016/j.brainres.2005.05.033, pmid:15961067. (2007) A role of the human dorsal anterior cingulate cortex in expression of learned fear. Biol Psychiatry 62:1191–1194, doi:10.1016/j.biopsych.2007.04.032, pmid:17707349. (2009) Neurobiological basis of failure to recall extinction memory in posttraumatic stress disorder. Biol Psychiatry 66:1075–1082, doi:10.1016/j.biopsych.2009.06.026, pmid:19748076. (1948) Studies of fear as an acquirable drive fear as motivation and fear-reduction as reinforcement in the learning of new responses. J Exp Psychol 38:89–101, doi:10.1037/h0058455, pmid:18910262. (1980) From motivation to action: functional interface between the limbic system and the motor system. Prog Neurobiol 14:69–97, doi:10.1016/0301-0082(80)90018-0, pmid:6999537. (2013) Active avoidance learning requires prefrontal suppression of amygdala-mediated defensive reactions. J Neurosci 33:3815–3823, doi:10.1523/JNEUROSCI.2596-12.2013, pmid:23447593. (1960) Learning theory and behavior (Wiley, New York). (1946) Fear as an intervening variable in avoidance conditioning. J Comp Psychol 39:29–50, doi:10.1037/h0060150, pmid:21018303. (2010) Infralimbic D2 receptors are necessary for fear extinction and extinction-related tone responses. Biol Psychiatry 68:1055–1060, doi:10.1016/j.biopsych.2010.08.014, pmid:20926066. (1997) Functional inactivation of the lateral and basal nuclei of the amygdala by muscimol infusion prevents fear conditioning to an explicit conditioned stimulus and to contextual stimuli. Behav Neurosci 111:683–691, doi:10.1037/0735-7044.111.4.683, pmid:9267646. (2010) Fear thou not: activity of frontal and temporal circuits in moments of real-life courage. Neuron 66:949–962, doi:10.1016/j.neuron.2010.06.009, pmid:20620879. (2011) Damage of GABAergic neurons in the medial septum impairs spatial working memory and extinction of active avoidance: effects on proactive interference. Hippocampus 21:835–846, doi:10.1002/hipo.20799, pmid:20865731. (1998) The Rat Brain in Stereotaxic Coordinates (San Diego, Academic Press). (2005) Lasting increases in basolateral amygdala activity after emotional arousal: implications for facilitated consolidation of emotional memories. Learn Mem 12:96–102, doi:10.1101/lm.88605, pmid:15805308. (2013) D-cycloserine administered directly to infralimbic medial prefrontal cortex enhances extinction memory in sucrose-seeking animals. Neuroscience 230:24–30, doi:10.1016/j.neuroscience.2012.11.004, pmid:23159319. (2010) Induction of fear extinction with hippocampal-infralimbic BDNF. Science 328:1288–1290, doi:10.1126/science.1186909, pmid:20522777. (2007) Amygdala-dependent and amygdala-independent pathways for contextual fear conditioning. Neuroscience 147:919–927, doi:10.1016/j.neuroscience.2007.04.026, pmid:17587502. (2010) Compensation in the neural circuitry of fear conditioning awakens learning circuits in the bed nuclei of the stria terminalis. Proc Natl Acad Sci U S A 107:14881–14886, doi:10.1073/pnas.1005754107, pmid:20679237. (1995) Fear conditioning enhances short-latency auditory responses of lateral amygdala neurons: parallel recordings in the freely behaving rat. Neuron 15:1029–1039, doi:10.1016/0896-6273(95)90092-6, pmid:7576647. (2000) The role of ventromedial prefrontal cortex in the recovery of extinguished fear. J Neurosci 20:6225–6231, pmid:10934272. (2003) Stimulation of medial prefrontal cortex decreases the responsiveness of central amygdala output neurons. J Neurosci 23:8800–8807, pmid:14507980. (2004) Lesions of rat infralimbic cortex enhance recovery and reinstatement of an appetitive Pavlovian response. Learn Mem 11:611–616, doi:10.1101/lm.79704, pmid:15466316. (2007) Lesions of rat infralimbic cortex enhance renewal of extinguished appetitive Pavlovian responding. Eur J Neurosci 25:2498–2503, doi:10.1111/j.1460-9568.2007.05486.x, pmid:17445245. (2010) M-type potassium channels modulate the intrinsic excitability of infralimbic neurons and regulate fear expression and extinction. J Neurosci 30:12379–12386, doi:10.1523/JNEUROSCI.1295-10.2010, pmid:20844133. (1999a) Defensive conditioning-related functional heterogeneity among nuclei of the rat amygdala revealed by c-Fos mapping. Neuroscience 94:723–733, doi:10.1016/S0306-4522(99)00331-0, pmid:10579563. (1999b) How do rats cope with the two-way escape problem in a homogeneous shuttle box? Acta Neurobiol Exp (Wars) 59:145–157, pmid:10497819. (2011) Dissociable roles of prelimbic and infralimbic cortices, ventral hippocampus, and basolateral amygdala in the expression and extinction of conditioned fear. Neuropsychopharmacology 36:529–538, doi:10.1038/npp.2010.184, pmid:20962768. (2009) Dynamic activation of the anterior cingulate cortex during anticipatory anxiety. Neuroimage 44:975–981, doi:10.1016/j.neuroimage.2008.10.022, pmid:19027072. (1966) Differential effects of shock intensity on one-way and shuttle avoidance conditioning. J Exp Psychol 72:294–299, doi:10.1037/h0023496, pmid:6007624. (1964) One-way vs. shuttle avoidance conditioning. Psychonom Sci 1:251–252, doi:10.3758/BF03342894. (2010) Activation of the infralimbic cortex in a fear context enhances extinction learning. Learn Mem 17:591–599, doi:10.1101/lm.1920810, pmid:21041382. (2001) Disrupting basolateral amygdala function impairs unconditioned freezing and avoidance in rats. Eur J Neurosci 14:709–718, doi:10.1046/j.0953-816x.2001.01696.x, pmid:11556895. (2004) Differential projections of the infralimbic and prelimbic cortex in the rat. Synapse 51:32–58, doi:10.1002/syn.10279, pmid:14579424. (2006) Microstimulation reveals opposing influences of prelimbic and infralimbic cortex on the expression of conditioned fear. Learn Mem 13:728–733, doi:10.1101/lm.306106, pmid:17142302. (1969) Improvement of shuttle avoidance by handling during the intertrial interval. J Comp Physiol Psychol 67:252–259, doi:10.1037/h0026787, pmid:5785613. (2014) The roles of the nucleus accumbens core, dorsomedial striatum, and dorsolateral striatum in learning: performance and extinction of Pavlovian fear-conditioned responses and instrumental avoidance responses. Neurobiol Learn Mem 109:27–36, doi:10.1016/j.nlm.2013.11.009, pmid:24291572. (2013) Prefrontal microcircuit underlies contextual learning after hippocampal loss. Proc Natl Acad Sci U S A 110:9938–9943, doi:10.1073/pnas.1301691110, pmid:23676273.